Bonus: each box also comes with a set of coupons. This month’s box came with an extra info card regarding Hello Fresh‘s 20-Minute Meals. I love a good salad, so this week’s first meal made me really excited. Sure, this dish appeared to be mostly barley, based on the recipe card’s photo, but arugula and Brussels sprouts definitely spell ‘salad’ to me (even if this one is on the hearty side). I began with preparing my barley by boiling it in salted water for about 25 minutes. The chopped Brussels sprouts and shallots went into a hot pan with olive oil (cut side down), and I salt and peppered to season. You may be able to tell from my photo that I had a little… incident at this point. My pepper grinder came totally unscrewed as I ground peppercorns into the pan. I guess that’s why they say to be careful in seasoning directly over your dish. I fished out as many rogue peppercorns as I could with a spoon and finished the cooking process in the oven. I whisked the honey and balsamic vinegar to create a dressing. Once my barley was done cooking, I combined it with the arugula, half of the package of cranberries, and the dressing. The arugula wilted down a bit when mixed with the warm barley. Check out that beautiful plate of food! I put a bed of the barley mixture on each plate, topped with Brussels, and finished the dish with a sprinkling of pepitas, feta, and the leftover dried cranberries. This meal was satisfyingly substantial for what I’d still classify as a kind of warm salad. The cranberries provided a nice sweetness while the feta added salt, and the pepitas incorporated crunch. All the bases were covered with this one! My husband and I are both big on Brussels sprouts, but, of course, if you aren’t a fan (as I know that many people aren’t), this isn’t the dish for you. It was a filling dinner, but I’d imagine that this would make a great lunch as well. Even cold, this dish would be a winner! First thought: I love asparagus! Second thought: This looks eerily similar to dish #1. I was looking forward to diving in and discovering how these dishes differ, even if the warm-grains-topped-with-veggies-and-cheese concept was the same. Per usual, I began with chopping up my veggies. And there were a lot of them. You’ll want to divide the tops of your asparagus from the stems after you chop off rough ends. Stems should be cut into 1/2 inch pieces. You’ll also zest your lemon which immediately fills your kitchen with the loveliest fragrance. These are the moments that I really feel like I’m hosting my own cooking show! Or, you know, at least halfway know what I’m doing. Onions and garlic are cooked down in a hot pan with olive oil and seasoning. Meanwhile, I had my farro boiling away in a medium-sized pot with water and the 2 packets of veggie stock. I roasted my zucchini and asparagus tops in the oven at 450. One side did get quite more browned than the other. The pieces weren’t burnt, though, so I was cool with it. You’ll probably want to flip your veggies sooner than I did — I think I waited 10 minutes or so. After combining the farro with the asparagus stalk pieces, parmesan, butter, lemon, lemon zest, and salt and pepper, it became the foundation for my bowl. I wasn’t expecting this after only glancing over the recipe card, but the farro took on a creamy, almost risott0-like consistency with the addition of dairy. Definitely already different from the barley dish that I was expecting this meal to be similar to! Hence its name, the finished dish was gorgeously green. It was topped with walnuts and the leftover parmesan and lemon zest. Similar to the first dish, walnuts, like the pepitas, add a nutty, crunchy component. The roasted zucchini had a buttery texture while the asparagus tips provided a nice bite. The acid from the lemon and its zest really cut through the richness of the cheesy farro. Can you tell that I loved this dish!? I was loving how flavorful it was! Definitely my favorite of the week. However, unlike the first dish, this one probably wouldn’t be that great served cold. There’s maybe a little more prep involved with this meal than with the first two. A bit daunting, but I also like to test my skills now that I’m on my 5th Hello Fresh box (on my way to pro chef status over here, thank you). I began by washing my sweet potatoes and slicing them into 1/2 inch wide ‘steaks.’ This was shockingly difficult to execute with ease. Maybe I just don’t have the right kind of knife to slice through large, dense vegetables? I settled on a long, serrated knife that got the job done. The steaks were placed on an oiled baking sheet with harissa powder and salt and pepper. I <3 harissa and was looking forward to this dish having a little kick! It took about a half hour in the oven for the steaks to roast and fully cook through. Again, one side was more well-done than the other, so be sure to flip sooner than you’d expect to. Sliced shallot and golden raisins marinate in vinegar to create a quick pickle. You’ll also need sugar on hand here. The rest of the sherry vinegar is drizzled over kale along with s + p and olive oil. I gently massaged that mixture into the kale leaves before placing it on a tray to roast in the oven. I gently heated my hazelnuts until they were toasted and removed them from the hot pan. From there, olive oil was added, and the breadcrumbs were too toasted. Combined, these two components make your crunchy topping! Some freshness! Nothing beats a sprinkling of chopped mint to add some brightness to your plate. If you’ve ever made kale chips, you’re familiar with the crispiness that kale takes on when baked. These kale pieces aren’t quite meant to reach a chip-level of crunchiness, but the added texture was there. The final product results in two really pretty plates. Just layer all of your components and top with feta and mint. I loved how each ingredient worked together to create a cohesive dish, and the roasted squash was pleasantly… meaty? My husband even remarked that it ‘smells like steak in here’ before making his way to the kitchen upon arriving home (we both don’t eat meat). I thought that was really interesting! Another delicious plate, and we even had enough leftovers for a small lunch side the next day. 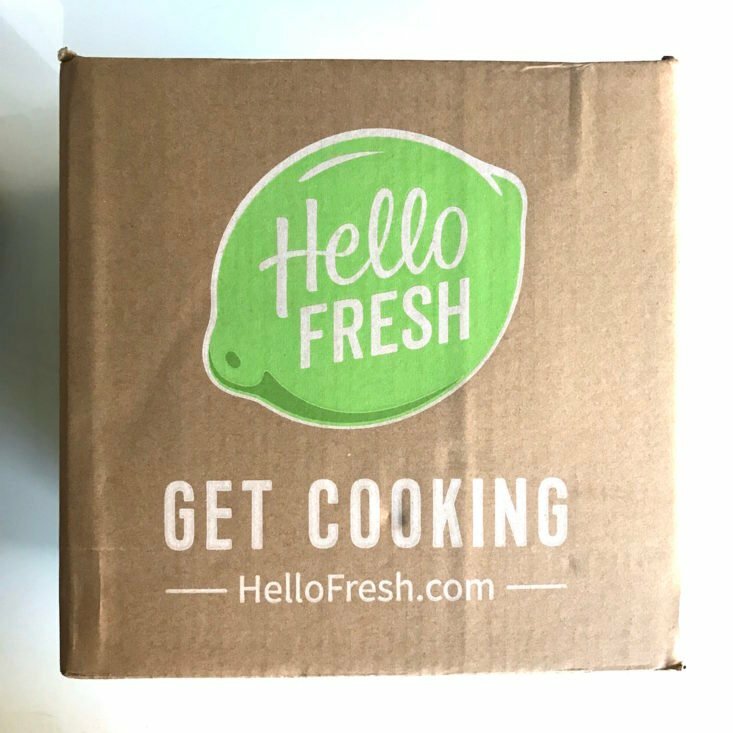 Verdict: This week’s Hello Fresh menu really delivered! Usually, I encounter one meal that’s only fairly decent, but all three of these were super yummy. I was also surprised by how different the two grain dishes were in the end. I’m continuing to love that Hello Fresh‘s recipes are really easy to follow with only 4-5 major steps. I’ve touched on this in my previous reviews, but I do wish that Hello Fresh had the option to allow subscribers to choose their own meals individually. Because I selected the vegetarian plan and have chose to receive shipments only once a month, I must sift through weekly menus for each month to decide which full week looks best to me. There’s also some fun in doing that, so I suppose all is well. It would just be nice to pick specifics if you so choose. You need a good “chefs knife” and keep it sharp! Thanks for reviewing the vegetarian option! The food looks delish. Great review! Everything looks so delicious. I love this vegetation option and it would be perfect for me. The meals look pretty satisfying too. Thanks for reviewing. The farro sounds so good yummmm and yummy pics! How about some reviews for the classic plan please? I’m so curious about the quality of the meat meals. Yes, can someone please review the Classic plan? My two boys and husband would be calling out for pizza if I served them a Veg. Meal. I’m curious how the meats arrive and how well things are packed/separated. Thank you! Great review. I think those meals look delicious.